My husband is on his 3rd deployment since 2001. We are expecting our second child in a few weeks (we have a 7 year old daughter) and he will be able to come home for that at least. I hear other women talking about their husbands being gone for a few weeks and I have to laugh anymore.. after an 8 mo, 18 mo, and now a 12 mo tour, their few weeks are like an AT drill for us (national guard). 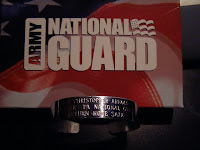 I have enclosed a pic of the bracelet I have ordered for my/his family. We will wear it until he comes home and every time he is deployed.